Today I have the rest of the shades from that huge, three-named Walgreens display. Depending on the way the store employees set the display up, this may not be the same as the assortment in the Heart & Soul section of the display. It's just what's left of the included shades after the Country Charmer and Rock It displays. I don't own Social Ladder or Pink Forever, so they're not included, though they are in the display. I've had enough pink for a while, so I skipped them when I bought from this display. Unicorn seems really out of place here, but it wasn't in the other two displays...so who knows? I also have a bunch of comparisons down toward the bottom. Beau Brique is a dusty brick red cream. Another shade I'm kinda startled to like! There's something retro about Beau Brique, like a 1970's kitchen....but I really do like it! I'm rapidly warming to the warmer side of the color spectrum, I think. Weird. It might just be my bottle, but the formula takes everything I usually like about Sinful Colors creams just a little too far. Sure, it's a one-coater, but it's way too thick and applying without bubbles was pretty much impossible. It smoothed out fairly well with with two coats of top coat, but I thinned my bottle before putting it away. Ruby Ruby is a bright classic red crelly. When I was swatching these, I was completely sure I'd done Ruby Ruby before. My spreadsheet said I'd worn it, but...I just have no clue. Maybe I'd worn it back before I started swatching or maybe I'd mixed it up with one of my many MANY other reds. It's somewhat similar to GoGo Girl, but a little sheerer and a hint darker and cooler. This is three coats and still a bit on the sheer side. It *might* be sheer enough for sandwiching, but I didn't try. Berry Charm is a berry pink crelly. I bought Berry Charm wondering how close it was to Truth Or Dare. They're not dupes, as you'll see in the comparison below. This is two coats, with a hint of visible nail line. Three reruns this time. Click the shade names to view the original posts. Envy is a jade green cream. You Just Wait is a sheer pink-to-green duochrome shimmer in a clear base. I took over 200 photos (using my camera and phone and even my partner's phone) trying to catch the shift, but it never quite worked. The shift is stronger in person. I got so side-tracked that I thought about giving it its own post. Instead, here are way too many photos of it. Finally, at the weirdest angle possible and mattified, I caught that green shift! Say hi to my livingroom ceiling in the background. Sticks out like a sore thumb among the other shades here, doesn't it? Oh well. VERY close! I'm a little surprised by how similar these two turned out to be. I got deja-vu when I put Outrageous on. Outrageous is a tad brighter and cooler, but they're damn-near dupes. They're all pretty close, but not quite dupes because of formula differences. Aubergine took three coats and is still a bit sheer. Berry Charm is almost opaque at two. Truth Or Dare is a one-coat cream and slightly darker than the other two. I thought of Sally Hansen Shoot The Moon as I applied Silver Screen, but they turned out to be less alike than I'd expected. Shoot The Moon looks almost green in comparison, because of the bright gold flecks. I'm really wondering how Silver Screen will compare to OPI Haven't The Foggiest when I get that. I'd seen Daddy's Girl and Sally Hansen Purple Pizzazz called dupes, but they're not. Purple Pizzazz is redder and the flecks are denser. They're both sheer to the point of being almost more like tints than colors, but I found Daddy's Girl much easier to work with. This is five coats of both. This is part of the reason I can never get enough taupes. Subtle little differences set them apart. OPI You Don't Know Jacques is darkest of these four, with purple undertones. 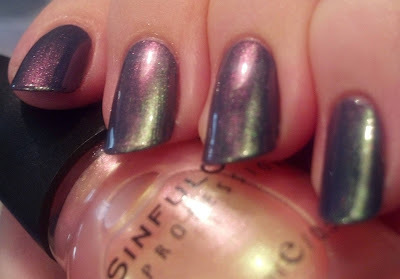 SinfulShine Rebel is close to the Sinful Colors core shade Nirvana, but Nirvana is a little browner and a touch darker and dries slightly matte. Graine De Poivre is almost a bit pinkish next to these other three. These shades are closer than I expected. OPI Suzi Loves Cowboys is a bit "softer" or more muted and L'Oreal Brownie Points is redder, but they're super close. No dupes here. Reader bleubelle asked how they compared, so I added this for her. Song Of Summer is lighter, softer, and grayer. Bottom line: Beau Brique and Berry Charm are both new. I wouldn't call either a must-have, but Berry Charm might satisfy a Truth Or Dare lemming and Beau Brique is an interesting retro earth-tone. Ruby Ruby's a decent red, but not a standout. Envy is AMAZING and you need it if you don't have OPI Jade Is The New Black or Orly Lucky Duck. You Just Wait is great for layering, but not as intense as some of their other sheer duochromes. Unicorn...well...it's pastel and it's not flattering on me or easy to apply. Tomorrow...a holo! An imported one in an unusual color! Oooooh! Thanks for the Pistache comparison - I think I like SoS a little bit better. Beau Brique is super pretty - I'll be needing that. I also must find Coffee because I need ALL THE BROWNS this year. I got Unicorn ages ago - it's been sitting in a box ever since. It's just not a good color - at least not for my skintone. Yeah, I'm the same way about browns and I don't even mind that I have such near-dupes. Unicorn is a really tough one. It looks good on so few people. Pale, rosy people seem to do best with colors like that.